Note: This post is now outdated. A new vastly revised and updated post is at this link. 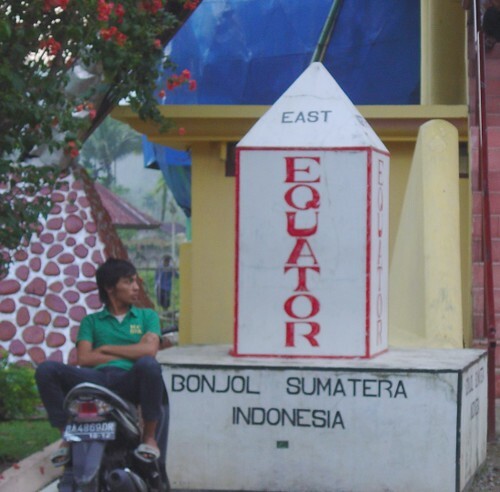 The Equator is an imaginary line on the Earth's surface approximately equidistant from the North Pole and South Pole and it divides the Earth into two Hemisphere - Northern and a Southern Hemisphere. Although major portion of the Equator lies on ocean but it mainly crosses Indonesia, Sumatra, Central Africa and South America. In few cities around the World, Equatorial Markers/Monuments have been erected to attract tourists. I have tried to locate such monuments and these are listed below in sequential order of movement of Sun from East to West. Maximum numbers of monuments (four) are located in Ecuador - a country whose name itself means Equator. However these monuments have some controversy regarding correct location on the true Equator. 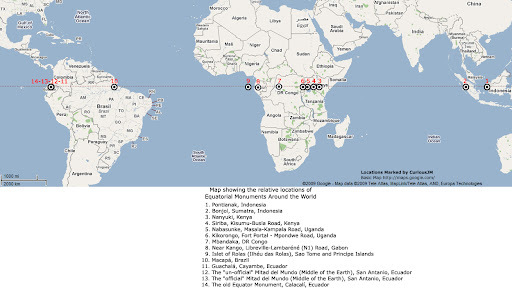 Here is a Map showing the relative locations. I request my readers to let me know if I have missed out any marker/monument. Based on the tools available with them in 1930s, the French Academy of Sciences had decided the location of the Equator at this site. Accordingly in 1936, with the support of the French American Committee, Ecuadorean geographer Dr. Luis Tufiño built a 10-meter monument at this location. In 1979, the old monument was moved 7 km to the west, to the town of Calacalí (see # 14) and a larger replica of the original monument was made at the site although it was and remains about 200 metres away from the Equator. This slightly mislocated monument is the official and touristy monument and is called "Mitad del Mundo" (Middle of the World). This monument was originally at San Antanio, about 7 kilometres to East, but in 1979 it was shifted to Calacalí, and is located near to, but not on the, true equator line. As per this website the Equatorial line is close to the Pileta de la Plaza de Cala Calí, about 180 metres North of the present location. I am thankful to Wacope who, vide his comments dated June 15, 2009, had given some suggestions and had also pointed out few discrepancies in my original post about the monuments in Ecuador. Unfortunately I read these comments only now. This post has been revised based on his comments. While revising I luckily found an equatorial marker in Mbandaka, DR Congo which was not included in my earlier post. This marker was created by none other than Sir Henry Morton Stanley of "Dr. Livingstone, I presume?" fame. I have now included this historical marker also in this collection. I am thankful to Yves Galipeau for informing me about the marker on Libreville-Lambaréné (N1)Road, Gabon and also about Agro-Gabon/Siat. The present revision is based on the information given by Yves Galipeau. I am thankful to Kelley MacTavish for pointing out a typographical error in my post. Based on his comments, the name for #5 - Nabasunke, Masala-Kampala Road, Uganda has been corrected to Nabusanke, Masala-Kampala Road, Uganda. hat's off to you CJ. nice research! Thanks to the article. Very usefull. this is my new num. 1 website as of right now!!! I love all things 'GEOGRAPHY 2 GEOGRAPHY" related. I own 7 globes of the world, have three (3) wallmaps of the world, own a Large atlas @ a small "pocket atlas" that Im constantly re reading all of the time. I love all these photos of "equator crossings". Incidentally, I myself have crossed the equator, but not at any of these sites in youre pictures that are posted. I crossed the equator in late 1983 or early 1984, in the Indian Ocean, onboard my ship the U.S.S. Fort Fischer, LSD=40.Quite an experience Ill tell you! Thanks for this great new site!, sincerely Randy T. Boe renton, Wa. I have Crossed the Uganda Equator!!! At this point, there are two cement circles marking the equator line and it is worth stopping if you are traveling to Masaka or Kampala for a photo moment. Also watch a demonstration by local entrepreneur on how water swirls in opposite directions in the northern & southern hemispheres at the equator line. Another reason that make equator worthwhile stop are the great shopping bargains. The point has got several craft shops and art galleries run by individuals and organizations. These craft stalls sell souvenirs and handmade products while some with marks talking about the Equator. It will not be inconveniencing if you bought a T-shirt with words ‘I crossed the Uganda Equator’. Thanks Kelley for the information and also informing me about the typo error. I will make necessary correction soon and change "Nabasunke" to "Nabusanke".